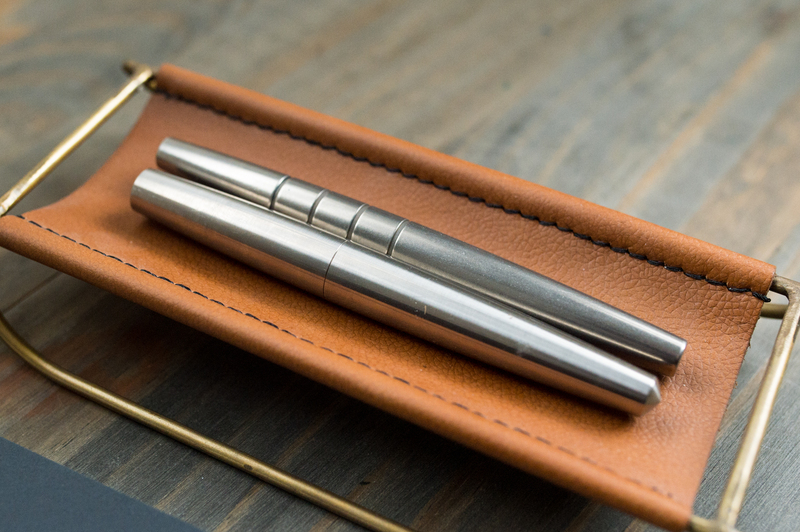 Description: A minimal (but not too minimal) fountain pen that’s made completely of titanium. Namisu is no stranger to me. I’ve reviewed several of their Nova fountain pens in the past and checked out their Nova rollerball. I’m a fan of the brand, when they included an Orion fountain pen in the last shipment they sent me, I looked forward to checking it out. For me, this is one of those pens that I didn’t love at first sight, but upon handling it and using it, I couldn’t put it down. Read on to find out more about the Namisu Orion! The Orion in stonewashed titanium is really cool looking. It’s a large, tapered pen with four deep groves in the grip section. The cap is just large enough to cover up the nib, and does not post. It does look nearly invisible, which is a really nice touch. They hid the threads where both the cap and body come together. It’s hard to tell, but the Namisu Orion is actually three separate pieces. The cap, grip, and body. Machining here is great, as you cannot tell where one piece ends and the next starts. I think the pen has a cool, organic look to it. The stonewashed finish definitely adds to that. For some reason it reminds me of the movie Prometheus. High tech looking, yet still uniquely organic – much like the feel of the film. 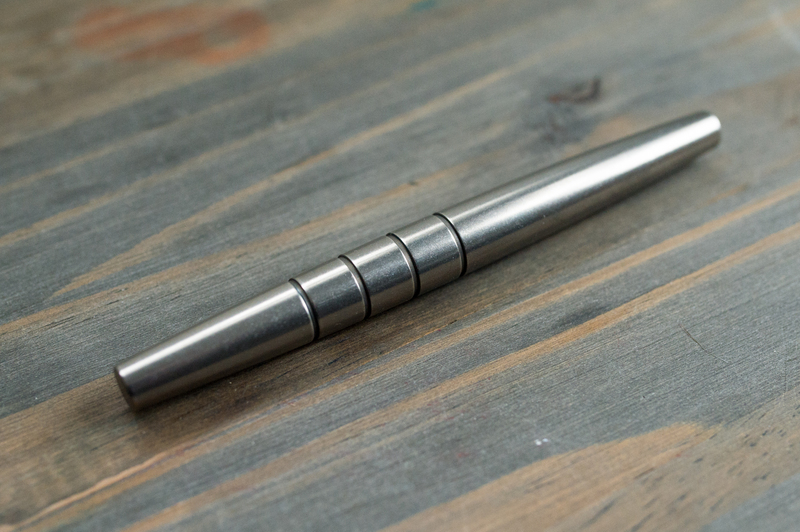 The Orion features a Bock titanium nib. I’ve used this same nib in other Namisu pens and the Tactile Turn Gist. I’m a fan of titanium nibs. They’re smooth, have a nice bit of cushion, and write on the wet side. The Orion’s nib leaves a nice line on the page, and there’s a lot of shading going on especially with this teal ink. The medium nib is a pretty true medium, nothing remarkable there. The pen fills via international standard cartridge or converter (included). Pretty standard there too. The best part about the Namisu Orion is how it feels. 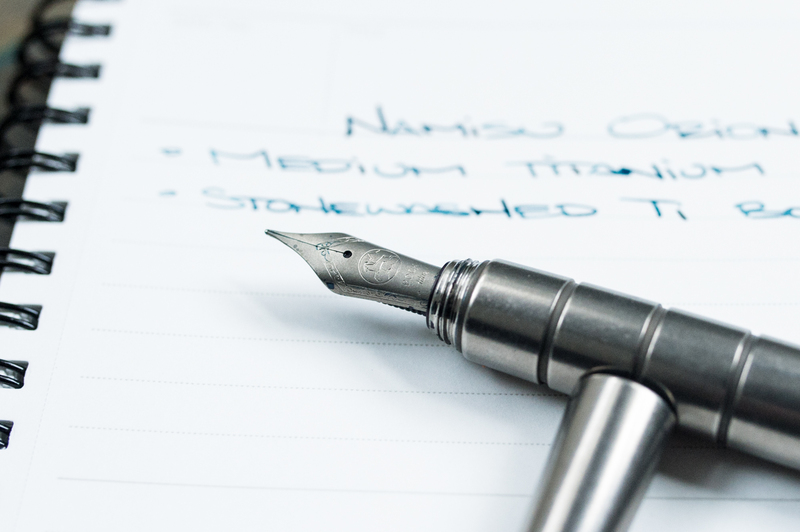 Most fountain pens have a well-defined grip section, usually with a little bit of taper. That’s not the case with the Orion. The body goes right into the grip, and it’s pretty wide. 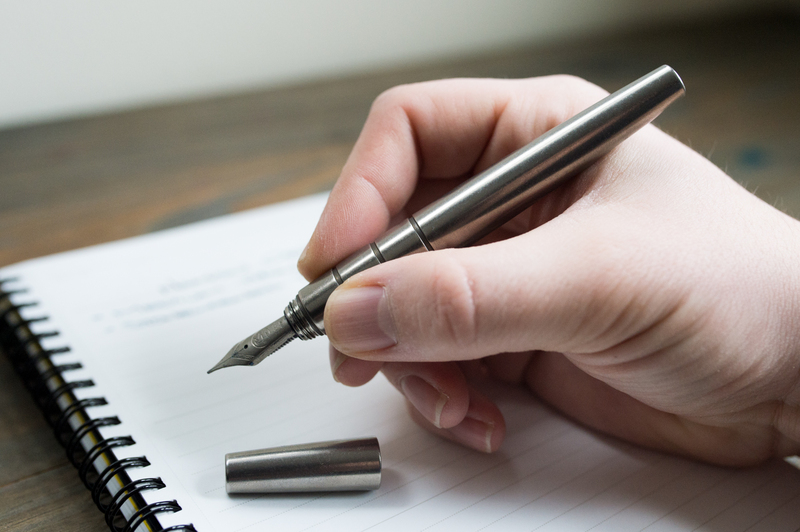 Typically, you see the cap of a pen go over the grip – again not the case here. It just covers the nib. The result is a wider grip section that encourages a grip with your fingers back on the pen more than others. This is kind of hard to explain, so make sure to look closely at the pictures. The stonewashed titanium body has a nice amount of heft to it without being overly heavy. Namisu’s machining and construction are top-notch. There are tight tolerances throughout and nearly invisible thread seams. They make a really nice pen, that’s for sure. The Orion is a cool pen, that’s done well. You can see that it’s a bit different from the smoother Nova. It’s different enough to where they don’t feel redundant in my collection. The Orion starts at $80 with a steel nib and around $120 with a titanium nib. I think the price is spot on for what you get. 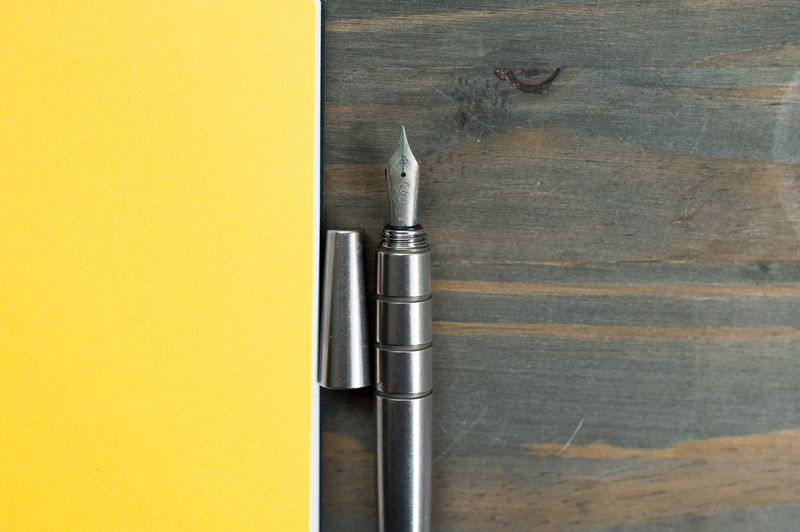 A minimal pen, but done right. There’s some unique features, the weight is great, and the wide grip is comfortable to write with. I’m definitely a fan. 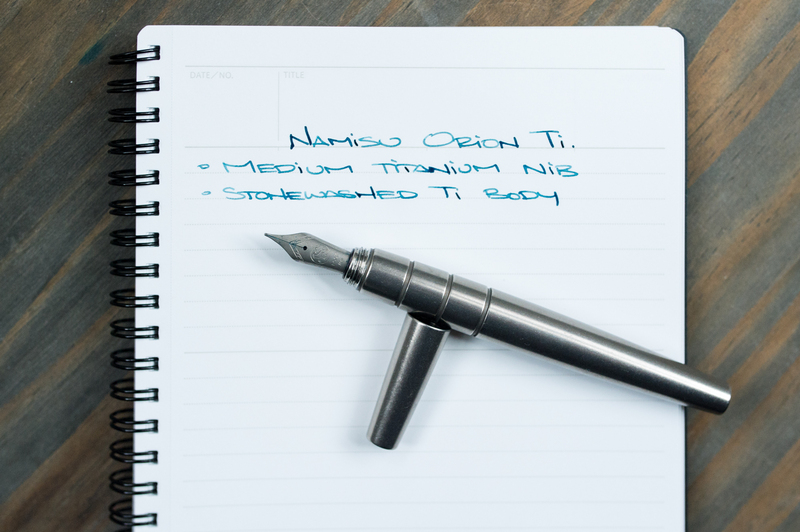 Want to add a Namisu Orion to your collection? Snag one here. Wait, what? What ink is that??? It’s a shame because it was a cool concept. 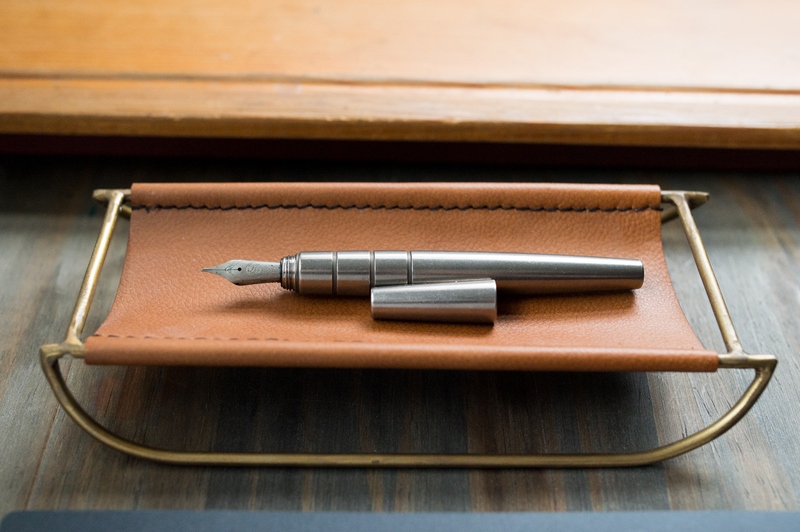 Where did you obtain your unique leather-and-brass pen rest? I see West Elm has something similar, yet not quite. (Apologies if you’ve already covered this elsewhere on the site). No worries! I got it as a gift, but it was from Anthropologie – probably from Holiday 2015 season.